Thiruvallikkeni aka Triplicane is a famed land… It is a place where religion, nationalistic fervour, patriotism, sports, education and the individual dignity have interspersed for the benefit of the State and the larger interests of the Nation. The place acquired its name from the famed temple pond ‘Kairavini’ – the pond of lilies – thus becoming ‘Thiru Allik Keni’ – the pond consisting of lily flowers. It is the Great Sri Parthasarathi Swami Thirukovil around which our lives dwell…. Triplicane was the seat of freedom struggle – it is a place of rich history and heritage…. There exist many famous people - many of whom live a simple life – recently posted about Kalaimamani GP Kamala and it is natural to post about another …. 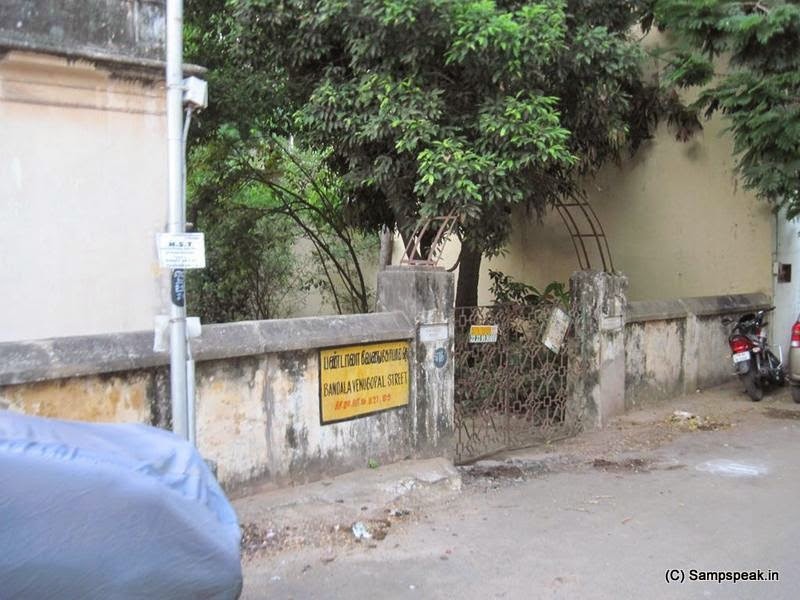 From the Icehouse which became Vivekananda House, as you travel in Dr Besant Road (named after Annie Besant) … there are smaller lanes and one such is BV Street [there are two BV – Bandi Venkatesa Naicken Street nearer Gangaikondan Mandapam and this Bandala Venugopala Naidu Street] … in the Bandala Venugopala street, there is one ancient house, which for sure would catch the attention of people – a house with a compound and a garden too. 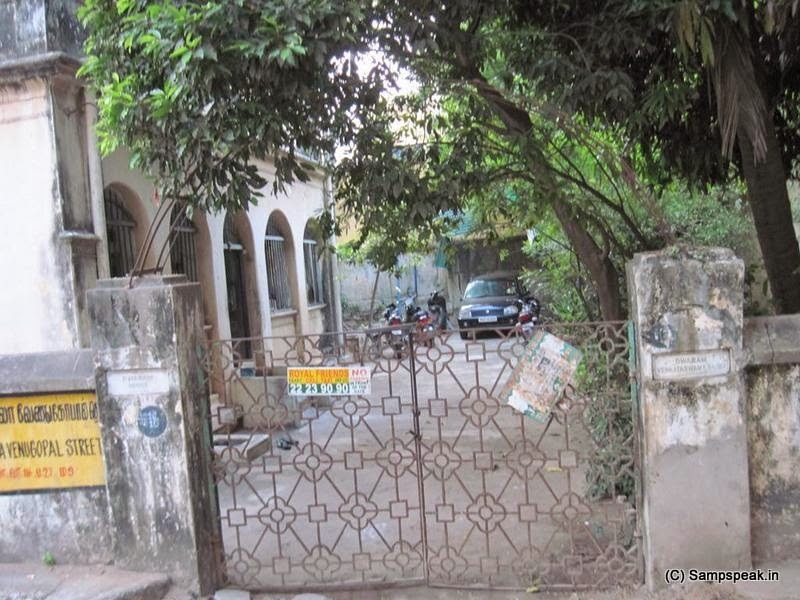 It is ‘Dwaram’ house and the recent residents can be excused for not knowing the greatness of this house and its famous residents…….. Way back in March 2006, our Bliss (newsletter of SYMA) featured a post on its famed resident and Yours Truly interviewed that frail women, a reverred violinist. One need to travel back to 1800s, in 1893, was born Dwaram Venkataswamy Naidu, who went on to be an inspiration to many aspiring musicians. Raised in Vishakapatnam, he was appointed Professor of violin in the Maharaja's Music College in Vijayanagaram, at the young age of 26, and became its principal in 1936. Have read that Dwaram accompanied almost all the stalwarts of the time, listened to Western and Hindustani music and even gave Hindustani touches to ragas. 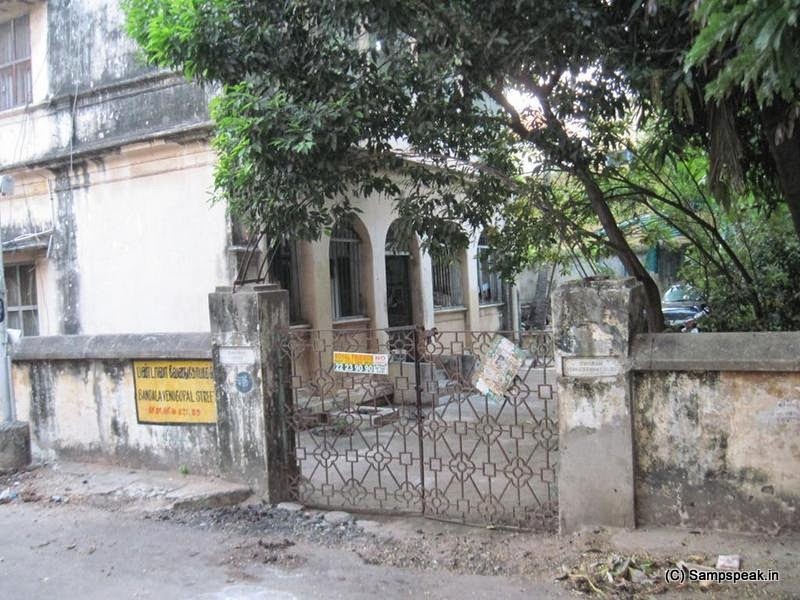 In early 1950s, Dwaram bought a house in Bandala Venugopala Street in Triplicane, and moved to Madras. The awards and titles that Dwaram won were legion yet this post is not about this man too….. It is about ‘Dwaram Mangathayaru’, born on 29th Aug 1937 at Vizianagaram in a family which boasts generations of Carnatic musicians. She is the daughter of renowned violinist Dwaram Venkataswami Naidu, who was at that time the principal of the music college of Vizianagaram. This unassuming great personality has been embellished with many titles & awards– Nadha kanal, Nadha Jyothi, Sangeetha Kala Jyothi, Thirupugazh Mamani, Nadha kala nidhi, Violin Vara gana sudha vani, Sangeetha nadha mani, TTK Award, Gangadevi Eminent Citizen award, Hyderabad to name a few and the conferment of Kalaimamani award on 25/2/06 was really another feather. In her early age, She studied vocal music under the guidance of Janardhanachari, a renowned veena player. Even in her schooling curriculum she studied music as a special subject. At a very young age of 14 she made a remarkable debut performance on stage as an accompanist of Chembai Vaidhyanatha bagavathar at Vizianagaram. She contined her studies in Waltair obtaining a diploma of violin playing as main subject. During early 1950s their family shifted to Chennai and she had intensive lessons from her father – Great Violin Maestro Dwaram Venkataswamy Naidu. At her tender age, she accompanied her father on concert platform before elite audiences that include – Presidents : Babu Rajendra Prasad, Radhakrishnan, Sanjiva Reddy; Premiers – Jawaharlal Nehru, Indira Gandhi, Rajiv and many other noted personalities. She studied vocal music from Sri Sandhyavandhanam Sreenivasa Rao. She was a recipient of scholarship for 3 years from the Govt of India under the tutelage of Sri Varahur Muthu Swami Iyer another violin vidwan of yesteryears. She imparted music to many as a Professor of Karnatic music in Maharaja college at Vizianagaram for few years and for over 15 years as a staff artist in All India Radio. In her later part of her career, she taught violin as HOD at Music Academy, Chennai. She has adorned many podiums as a professional accompanist and solo artist. Initially, she played violin in hundreds of concerts with the legend flautist TR Mahalingam. She performed duet concerts with her brother Dwaram Sathyanarayana moorthy. She has played alongside many vidwans on stage, the long list which includes – DK Pattammal, MSS, MLV, Veena Doraiswamy Iyengar, DK Jayaraman, Dr Balamurali Krishna, Oleti Venkateswaralu, S Ramanathan, Radha Jayalakshmi, Bombay sisters, Prema Hariharan, Mani Krishnaswamy & more. She has toured widely many countries enthralling audience Internationally which include Germany where she performed duet concerts with her brother in 1973 as also Amsterdam in the same year. She has toured USA in 1996, 2000 & in 2001 performing at the music festival organized by the Telegu Fine Arts society of New Jersey besides performance in many many concerts all over. For months she taught students in Pittsburgh before the divine Sri Venkateswara. intense learning in the nature of gurukul would only produce rich and resonant quality learning. It was a great occasion for me talking to her in person, recording her achievements and posting them in Bliss. Now with the current social media, comes another opportunity to place this on my blog as also on FB. Great to see this. I was a student of Dwaram for a brief period(though I lived > 15yrs in triplicane) after which I had to move out. I truly understand when she says "the young generation has less of patience and is drawn to the fast food culture sans nutrition".If you have her contacts and pass it on to me,I will be really grateful.